A digital survival guide for all of us. An eye on today's digital times. 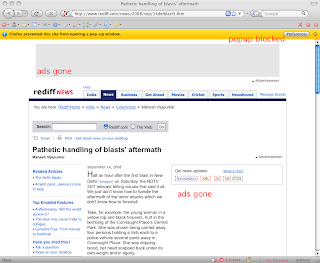 One of my most loved Firefox extensions is AdBlock. 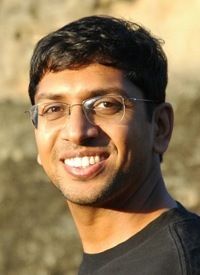 It helps keep the web free of ad-clutter and delivers content without being overcrowded by advertising. One can hardly see any content without scrolling down and hunting for it. 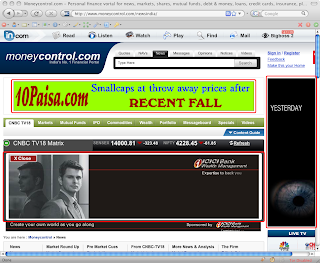 moneycontrol.com's news page contains a banner ad, a sidebar ad and a flash banner in the middle. 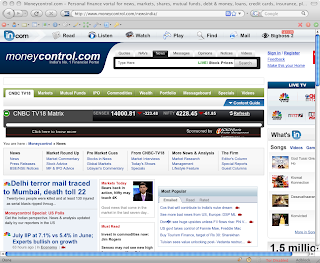 And here's how moneycontrol.com looks with AdBlock. Much better, don't you think? rediff.com has really annoying pop-ups which you have to click off first, and then get to the content, which is heavily garnished with banner ads. 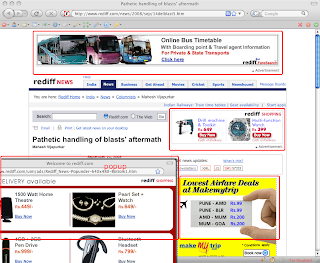 AdBlock cleans up rediff.com's article page, making it actually readable, and Firefox blocks the annoying pop-up. Convinced? Here's a nice guide on how (and why) to install Firefox extensions.